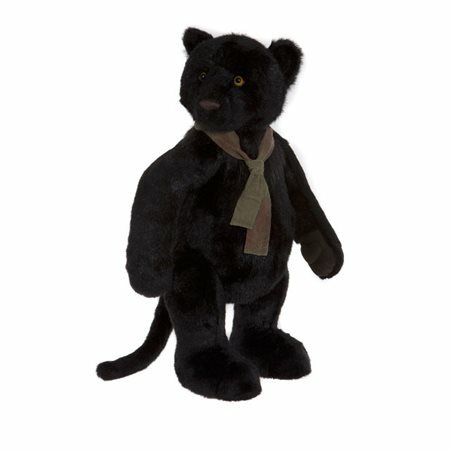 Shadow, another adorable wild cat has now been added to our bigger bear series in the form of a black panther, like Sheba and little Chica she has been created using an exquisite short pile black plush which is thick and luxurious and has a gorgeous sheen to it. She has friendly bright yellow eyes, a chunky handstitched nose, small pert ears and a thick set tail. Shadow is fully jointed with paw pads to enable her to stand alone. Shadow will arrive with a limited edition certificate to show that only 1,000 of this gorgeous characters will ever be made. These big cats will add a sense of grandeur to your hug! Atiqar is slightly smaller but Shadow, Kimba and Lazarus all stand tall and proud.